He was emaciated, so much so that he could hardly walk upright. Instead, he toddled like a young child. I fed him. How could I not? I brought him inside and into the spare room. I told him that if he lived through the weekend, I’d take him to the vet. But I honestly didn’t think he was going to live. And yet, he did. The scrawny little kitten was actually an 8-year-old neutered tom. I never found out for sure where he came from, but I think I know. I’d seen a beautiful white cat two doors down. Those folks moved, two weeks later men went in to work on the place, and this cat appeared. So he’d probably been left alone for someone else to rescue. Or to die a slow and painful death. Between 35 and 45 million households in the US include a cat. And one-third of those cats were acquired as strays. That’s not surprising since there are an estimated 70 million strays in the US. I personally have never bought a cat or even adopted one from a shelter. They were always strays. Where do they come from? Some are like Malachi and are left behind. Some are cats that are “put out,” and get lost. And some are the offspring of other strays. Hard to believe it’s the same cat. Between 80 and 90 percent of owned cats are spayed or neutered. Then where do these millions of strays come from? The 10 to 20 percent of us who were irresponsible. So you see, it’s not that there are so many of us are bad actors. It’s just that the small number of us who ARE bad actors do a lot of damage. Painful to read about such cruelty. Makes me hug my special friends a little tighter x.
OH Jen…..I didn’t know that story of Malachi….poor little boy – that’s just so very sad and I’ll NEVER understand how people can do that. I’m happy you showed him such kindness and gave him a life he so deserves to have….he’s really just GORGEOUS….the photo of him “before” is heartbreaking. It’s not a unique story. Fortunately many have a happy ending like Malachi does. Great job. I just hate that any being must endure such sadness,but then he found you. He was fortunate. Many are not. As a rescuer, I so know that. Every one a blessing. That is a beautiful cat. He is so lucky you found him. Our cats are also strays and they found us. My daughter takes care of them, and they have turned from wild, hungry and ill to loving and beautiful members of the family. It’s so sad to see so many strays! Bless him. He knew the right door to run into! Malachi was a very lucky fellow to happen by you. This is too common a story. I hand-raised a kitten who’s mom was a feral killed on the highway. People had given food to the kittens and eventually caught them, but this one was starving – at five weeks she was bald, and fit in the palm of my hand. I didn’t think she’d make it. We ended up having 17 great years – she passed a year ago and of course I will always miss her. I wish he could have a home of his own. I remember when you first brought him in and were going to try and find a home for him. I am glad that you kept him as he has turned into a beautiful kitty under your care. He would have been better in a home with fewer animals. I still remember when Jen found Malachi posting his sad pictures on your blog looking for forever home for him. Look at him how good he is now! He used to be so skinny….losing his fur because of skin problem…but Wow! He has now so beautiful white fur!!! How lucky he is to have found his lovely home! There will never be enough homes. We have to focus on the root cause of the problem. I’m sure Malachi is grateful that you found him and took him in. You have a big heart. As for the folks that toss their pets away like used tissues, there is a solution. If pet identification (chips) were mandatory and attached electronically to their owners, that is to say records were kept of who owned the pet, and the pet was discarded, those owners would be fined a (very) hefty sum and some kind of mark placed in their record, sort of like points that are put on one’s drivers license. Deciding to have a pet should not be a whim. They are living creatures that need love, food and shelter. And medical care. It’s not for the faint of heart, but the rewards, unconditional love and companionship, are worth it. And those that do not place value on those (non-human) lives should be held accountable. Hit them in their wallet and things will turn around very quickly. That’s my .02. It sounds good in theory but in fact such a law would be impossible to enforce. I’m so glad Malachi found a home and you were there for him. It makes me sad that people dump their pets, when they move or change something. They were a part of their family, sometimes for years, how can they leave them behind? They believe that what they’re doing is OK. They think the animal is used to the area, can care for himself, and will care better than if surrendered to a shelter. You did an amazing job rehabilitating him! Hope you don’t mind, I shared this on my blog’s Facebook page. Oh my gosh, I didn’t know this story, he’s so lucky you were there to save him! Lucky, lucky Malachi. You’ve really touched a lot of hearts today by sharing his story. I took your advice. Thanks! Me and my mom-person is so glad Malachi found a home and you were there for him ! My mom-person have never understood how anyone just can leave their pet/pet´s behind ??!! There are many reasons. I choose to not see those people as bad but instead misinformed. Oh my goodness!! You wonderful woman you Jen!!! Good for you. I am so happy to see that that is the same cat , and he is super healthy and happy thanks to you now!!! Anyways, this kitten was on my step and I spotted him, half froze to death, not enough energy to even lift his head to the bowl of food. I took him in right away, wrapped him in a towel to warm him up, and tried feeding him watered down wet food, etc.. He didn’t eat, he was going to the bathroom on himself. His system was shutting down, I could tell. I called a rescue group that I knew would help, and they did, and somehow, someway this “kitten” made it! He pulled through and is currently up for adoption awaiting his home. BUT the reason I had to tell you this story, is after they looked at his teeth it helped them determine his age, and they said he was between 7 and 10 yrs old. Yet he looked like a tiny kitten….it was a horrid situation for me, my heart was broken, but he got the help he needed, I just thank god I found him on my step alive and not to late. Sorry for the long message, but your post brought back that memory for me. You are a good woman Jen! Like I said, it’s not an isolated case. Happens far too often. Poor sweet Malachi. I’ve adopted but I did rescue a stray and fostered. It’s so sad people view pets as property not as sentient beings. It is sad, and it’s our job to help them change how they see animals. Oh, how horrible to abandon any animal to die slowly like that. So happy you took it in. It is a handsome cat. And quite the love bug too! It is sad but at least there are good people like you that are willing to help them. We had neighbors with a cat who kept him fed but paid no attention to him. He would come to my house for attention. Once, during a hurricane, the people evacuated and left him outside. I saw him scared and huddled on the windowsill so I called my next-door neighbor and the two of us fought the wind and went accross the street to get him. How awful! Sounds like you are good people too! When I moved to a town that was 30 miles away, I had two cats to relocate. They were both indoor/outdoor cats that I had cared for for seven years. Albert was always hanging around and on moving day I brought her with me. Leary, however could not be found anywhere. I searched and searched and so did my dear friend who had helped me move. So, I do understand how some pets can be left behind in a move. Luckily for me and Leary, my friend kept looking while I was out of state visiting family, and she found Leary underneath the house. She had been shot by a bb gun. Probably by the neighbor’s teenage boys. I took her to the vet when I returned from my trip and she survived after some treatment for infection. After that experience I decided not to let my cats go outside anymore. I know that’s not everyone’s choice, but it keeps me at ease and my five indoor cats are amazingly bonded to each other and to my husband and me. My cats remain inside as well. It’s safer for them and better for the environment. Cats kill an alarming number of birds. And yet it happens so very often. I think I have one of those portals too. I took the garbage to the road Sunday evening and saw two fussing in my front yard. I think they have homes, but they ran off before I could get close enough to get a good look. Wow look at the difference in photos..
Yeah. He looks a lot different but he never forgot. He is always right at the food bowl when it’s time to eat. It’s better than before for sure! Oh, what a sweet cat! Thanks for this post. I love cats and have three of them, all from rescue shelters. When I lived in Tokyo, I started to feed a couple of cats who had been abandoned when their family moved. Eventually, I had them seen by a vert, the male neutered (the female was spayed but the stitches had never been removed…) they were adopted by an American guy and they moved to California. Sweet revenge, eh?! Happy ever after for sure! I hate and will NEVER understand how someone can abandon a beloved faithful companion for whatever reason. I hope one day you will understand, because that is the only way we can end it. Very glad that you found the poor kitty and he is back to being a beautiful puss cat again. I will never understand the selfishness of others over the unconditional love of a pet who is left behind to “fend for themselves”. How does one live with themselves? You are very kind and obviously love animals. But we knew that because you took in Rumpy and look at what a wonderful dog turned out to be. Malachi knew he had landed in a good place and fought to stay alive to be there with you. All three of our wonderful cats were stray youngsters. Malachi is quite the handsome guy, thank you for saving him! ps I don’t know what more we can do?! We are kind to our animals, caring, and gentle and always do our best by them. How can we honestly stop those who couldn’t care less?! We can educate them without being confrontational. No one wants to be preached at. They want to be won over with kindness. Thank goodness, because he was near death for sure. So damn sad….seen it too many times…the poor waifs that would come into the shelter and we had no idea their age because of their condition..then to see them after they were healthy..the lucky ones…and pictures that their new families sent in…different animals…got to the point that when the rangers car arrived I would feel sick at what we would be greeted with..and love them usually they responded with such sweetness at a kind word even..still have bad dreams…. Some good news for your day Jen…well a bit..ACT has just declared they are banning Battery Cages for hens Sow stalls and Farrowing crates in their state..let us hope this spread through our country! Wow! That’s an impressive Before and After! beautiful Malachi thank goodness you had such a strong will and you found such a wonderful home! We are firm believers of spay and neuter in our family! If yu can’t take care of a pet, you shouldn’t get one. Folks have different ideas of what “taking care” means. That’s a problem. Oh…come to think of it, when I was a kid, my mom bought a trailer to refurbish and rent (we’re classy like that) and when she unlocked the door, she found a cat. The trailer had been empty for over a month and they’d just left the cat locked inside. I don’t know what it was living on. You can imagine how the place smelled. But the cat came home with my mom and it hated us for about five years and then one day, it just stopped hating us. We were finally able to brush her and get her knots out so she didn’t have to resort to pulling them out with her teeth or getting trapped to be taken to the vet to be put under so the vet could get the knots out. It was a win/win situation. And she turned out to be a sweetheart. I am always heartened to find other families do this, too. Malachai looks fantastic and is obviously very happy to have found you to be his person. Wow! Thank goodness for rodent infestation is all I can say! Or carpets full of spilled food? She was definitely a survivor. Bless you for doing that. It is hard to believe it is the same lovely animal. I will never understand how people can do this to an animal. They deserve much more. I’m delighted for Malachi that you found each other. It’s awful that any one would leave an animal alone, without food or water. Yes, there are some bad characters out there. Heartbreaking and overwhelming but we mustn’t turn our faces/backs away from drawing attention. Thank you for that. And, all you do. It is truly sad that humans,the “superior race” can be so cruel! 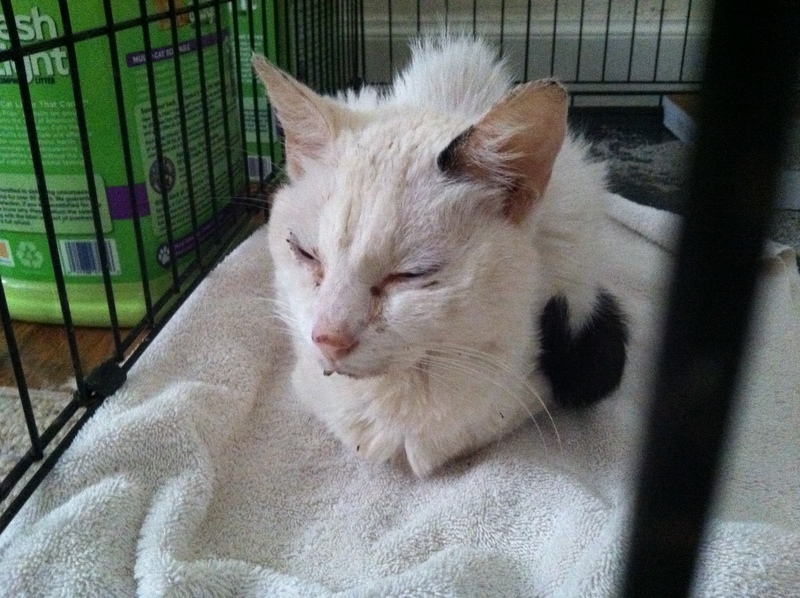 Purrs to you for saving Malachi. Austin was an injured stray. I didn’t rescue him, but I did adopt him. You did good by Malachi, Jen and all your troop! Lots of us do. Statistics prove it! That was Malachi?? For real Jen?? Oh my goodness!!! I am in tears…how could anyone have left that sweet boy behind? 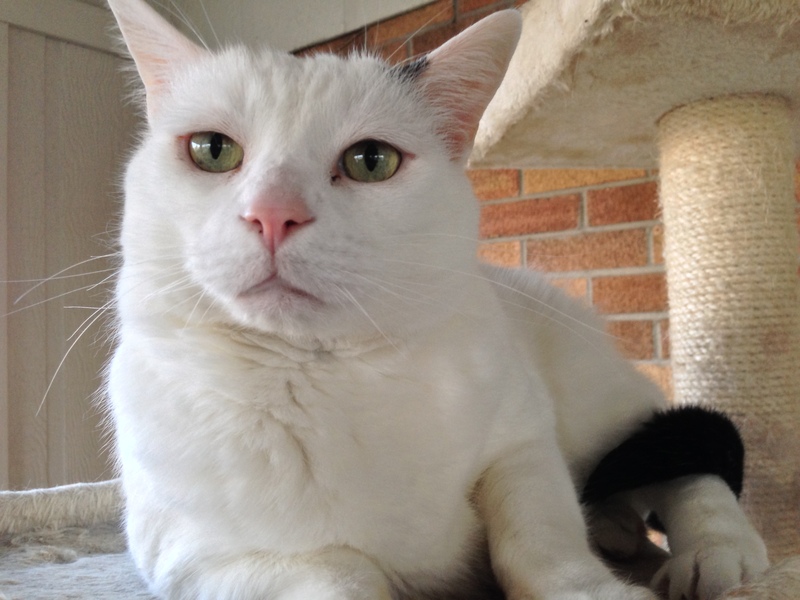 Their loss; your gain…Malachi is one handsome cat & I am sure he is very very happy to be with all of you! I agree with the above comment. This story was hard for me to read, but I am so glad you shared it. It’s so important to share these stories so that people can be educated.